Occasionally attaching a drive to a computer will appear to work, except the drive's nowhere to be found. I'll walk through one common solution. Is there a LIMIT to the # of hardware units I can attach to my PC? Windows XP seems not to recognize ALL the "drives". How can I troubleshoot this problem? XP software tells me that the drive I want to attach using "Add Hardware" is "functioning properly" but when I "explore", the hardware is not listed as attached and therefore is not accessible. What gives? There's probably a limit, but a) I have no idea what it is, and b) I'm fairly certain that that's not the problem here. It's frustrating to have a "functioning properly" drive not be accessible - I mean what's the point of "functioning properly" if you can't use it? I'm also not sure exactly why this happens, but it does and I'm sure there are several possible explanations. I'll show you the first place I look. This shows you all the connected disk drives, and as in my case, the connected memory card reader slots, some of which may or may not be occupied. "... for one reason or another a drive letter hasn't been assigned." That one drive - "SD1024-1" doesn't have a letter assigned. In fact, I can't see it in Windows Explorer at all. That is what I believe may be happening in a large number of these "functioning properly" but still inaccessible drive situations: the drive has been successfully attached to the system, but for one reason or another a drive letter hasn't been assigned. If you find your attached drive there in this condition, then that's probably what's happened to you. So we'll assign a letter. As you can see the drive can't be accessed because the list of the ways to access it is empty. Ignore the "Mount" option, we're just going to assign a drive letter. As you can see Windows has defaulted to the first available drive letter, which on my system is "G:". That's a dropdown list, though, and if you'd like the drive letter to be something else you can select it here. Lo and behold, the drive letter's been assigned to the drive. Naturally, this doesn't cover every case of a connected drive not appearing, but in my experience this is a common enough occurrence - particularly with the "functioning properly" notification - that it may well cover your situation. 26 Drives? Is there a way around the 26 drive limit in Windows? 26 drives appears to be the limit within Windows, with drive letters assigned A: to Z:. There are alternatives to 26 drives that are, effectively, limitless. 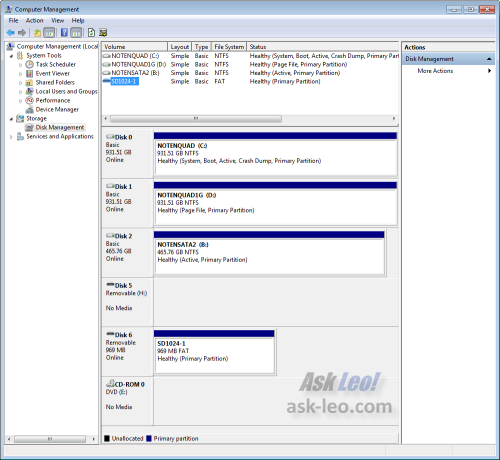 How do I format and partition my new external hard disk? Partitioning and formatting a new disk, internal or external, is often not needed but it's easy to do using Windows built-in disk manager. In Windows 7 can I assign drive letters (temporarily) to the recovery partition and the "SYSTEM RESERVED" partition so I can see what's there, or will doing so make my PC unbootable? If you can do it, it's safe. Those drive assignments are part of Windows, so they don't take effect until after Windows has booted. EDIT: Right-clicking on the nameless recovery partition yields nothing but a link to Help, which of course offers no help. So the answer to the first half of my question is no, I reckon. I have run into a similar problem often. 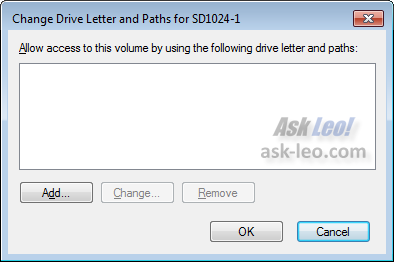 On Windows XP systems if a drive letter near the beginning of the alphabet, say E, is assigned to a network drive, a bug in XP causes it to get confused with newly inserted USB devices. If E would be assigned to the USB device had there been no network share, you end up not seeing the USB device. 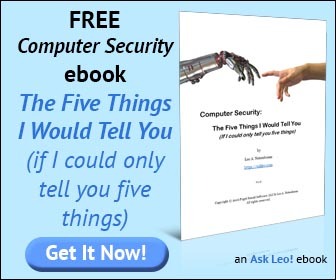 Change the USB device to F or G or H, as Leo described, and all is well. That XP has this bug for so so long, says a lot about Microsoft. I had a similar problem with my HP laptop. The CD/dvd drive "disappeared". I did some research (using Google of course)and discovered that this was not an isolated problem. The solution was to make a change in the registry. Once that was done,the drive "reappeared" -- only to disappear once more later on. More research and a second edit to the registry to keep the first one from being changed again. Some software I had was doing it. I'm sorry I can't be more specific but I'm writing this at work and don't remember the exact changes required. PLEASE read this, for this issue. I can detail this much more than here, I was researching this problem for over TWENTY hours !! "usb drive is not assigned a drive letter"
The gentleman's name at the bottom of this thread is part of the thread which I captured, KUDO's to him ! Leo, any response to this to my mail, is appreciated, for further diagnosis, as it drove me NUTS !!! and Windows XP tries to install some kind of driver, which it cannot find! As a result this entire external drive with all the data on it has become inaccessible. Do you have any recommendation as to connecting and salvaging this external drive? I had this problem quite a while ago on a Pavilion running XP and several USB external drives. HP support recommended a BIOS upgrade and this fixed the matter. I tried to assign a letter to the hard drive and it would not let me as it was grayed out. So a friend suggested that I use a tool called MiniTool partition Wizard home version. I was able to put a letter to the drive using that software, but when I went back to the main screen it was still blank, well it did have a "Star:" and I was still unable to access the drive, but looking closely at the software I saw they has another program called the MiniTool PowerData Recovery 6.6. I installed that and was able to copy to files to my other hard drive. Software was free to home users, but the date recovery was limited to 1 gig. You might want to take a look at the software and see how useful it is. Thanks for answering back, I read all of your articals. nicholas spagnola comment was bang on! Just modify the registry to the proper value of 0. When I navigated to the key my value was set to 1 which indicates the automatic drive assignment was disabled. I now changed my value in the registry to 0 and voila! The problem was fixed. THANKS VERY MUCH for posting this Mr. Spagnola. Was frustrating to find the answer.